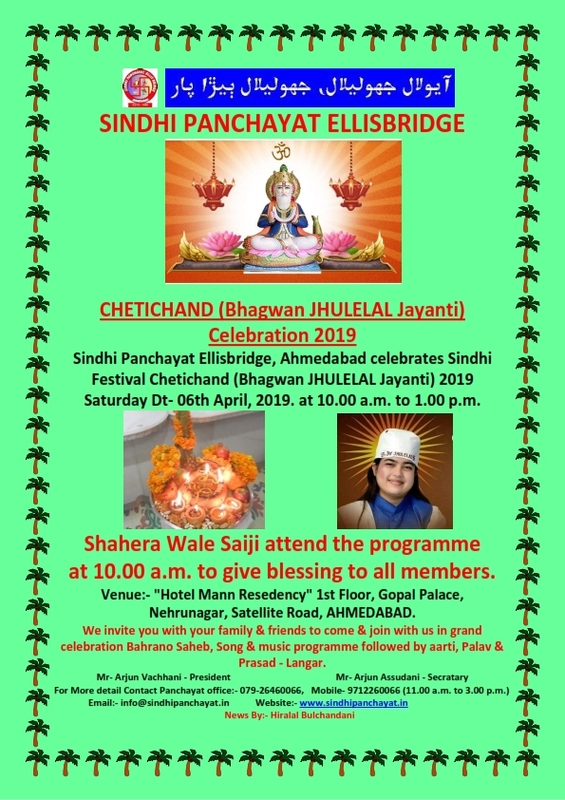 Sindhi Panchayat Ellisbridge, Ahmedabad celebrates Chetichand (Jhulelal Jayanti) 2019 on Saturday Dt- 6th April, 2019. 10.30 a.m. to 1.30 p.m.
Shahera Wale Saiji attend the programme at 10.00 a.m. to give blessing to all members. We invite you with your family & friends to come & join us in grand celebration Bahrano & music programme, followed by Aarti, Palav & Prasad - Langar. Sindhi Panchayat Ellisbridge, Ahmedabad - is a Non-Profit Organization and Department of Social Service for development of the Sindhi Society, Helping them in Education, Matrimony Services, Supporting several Events and Cultural Activities for the awareness of Sindhi Cultural and Community. Copyright @ 2013 Sindhi Panchayat.